On October 24, I had the opportunity to sit in on my district’s House Candidate Forum held at the Windsor Heights Community Center. Â The event was well attended and the audience was very cordial and appreciative of the candidates. Â Chris Hagenow (website ), a Republican lawyer who currently represents the district, and Susan Judkins (website ), a Democrat who currently works as aÂ Community Development Specialist for MSA Professional Services. The candidates were given an opportunity to provide opening comments. Â Both provided background and expressed an interest in working with members of the House on both sides of the aisle. Â Susan was a Republican until 2003, and considers herself a fiscal conservative. Â Chris shared his satisfaction over this past session’s success in providing a balanced budget. I won’t cover the whole session blow-by-blow, but note a few key thoughts. 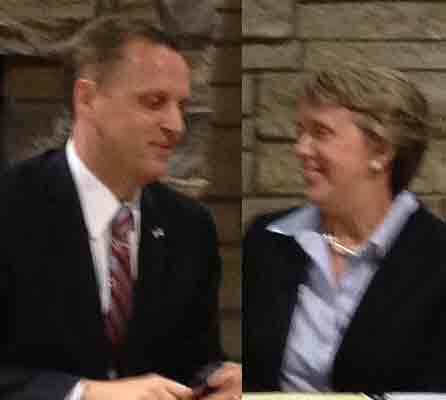 Both candidates tended to provide answers that were similar in nature around priorities and needs in the state. 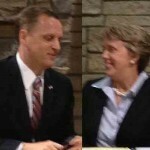 Â It was clear that they both understood what is on the minds of the voters in District 43. Â The cordiality was both pleasant after watching the presidential debates, and a bit discouraging as finding real differences was a challenge. Â Chris and Susan both were quick to say clearly that they agreed with each other on many topics. Â They both see the Economy, Education and Property Tax Reform as key areas to work with members of both parties for success. Â Small Business growth is clearly a focus of success in both candidates’ minds. One of the best ways to see their differences can be found in how they each want to deal with Property Tax Reform. Â Chris wants to roll back rates. Â Susan wants to maintain the rates but provide an income tax credit up to a certain value. Â As a result, the spending at the local level continues as before, but now being subsidized by the State. Â If local taxes are too high, then Susan’s solution just pushes the problem up a level of government, but doesn’t really solve the problem, especially if it is felt everywhere in Iowa. Â (I personally disagree with the State stepping in and telling local communities how much tax they can collect, and more-so having the state subsidize the local community. Â The local leaders should be directly accountable to their taxpayers, period.). Â I’m impressed that Susan is considering an idea to try to compromise on this issue. Another example, also related to taxes, is when asked about the Gas Tax, Susan also expressed an interest in raising it, and Chris said “No”. When asked about funding for libraries, the self-proclaimed fiscal conservative expressed an interest in using the existing surplus in the State Treasury to provide additional money for libraries. Â This is a type of comment to watch for. Â We’re talking about funding something that is slowly becoming less and less important to society, and will likely never recover because everything is going digital. Â Yes, even in the digital age we are seeing ways to continue using the community lending model, which I applaud, but I don’t see the need for state funding to subsidize libraries any longer. Â If a community wants to provide this service, they can raise the money locally. Â The surplus (this is money beyond the Rainy-day Fund) needs to be returned to the tax payers, not be thrown at non-existent problems. Unfortunately, this thinking exists across both parties. Â Just because the revenue has been gathered doesn’t make it the property of the State leaders to squanderÂ frivolously. Â It belongs to the people, and should be returned to the people as soon as possible. On this same evening, I happened to run into Desmond Adams (along with Michael Libbie, whom I’ve known for a couple of years now) for the first time. Â Desmond is on the ballot in my district for the Senate seat that was held by Pat Ward, but for which a special election is now planned due to Pat’s death. Â I’ve heard this from others, but meeting Desmond convinced me that he will be a formidable candidate and would have made Pat’s campaign a challenge if she had not passed. Â Desmond gave me his door-knocking speech, and we had a brief discussion about fiscal matters of the State. Â He, similarly to Susan, would like to see the State’s surplus put to some use, but he definitely comes across as a moderate Democrat with a desire to see the State address opportunities for efficiency while meeting the needs of individuals. Â I’m very impressed with hisÂ demeanorÂ and some of his ideas, which brings me back to the fact he is a compelling candidate. Â This will be a short campaign (Republicans select their candidate this Thursday evening, and the election is on December 11). Â Whomever is selected to run against Desmond will need to be ready to make an equally compelling case. Â This may be a more heavily Republican district, but I expect Desmond will make this a hard battle.